Montblanc Meisterstuck Classique Ballpoint Pen - Le Petit Prince.The new collection is a masterpiece not only for its exceptional design, but also for the message it is trying to transmit in our fast paced human world. 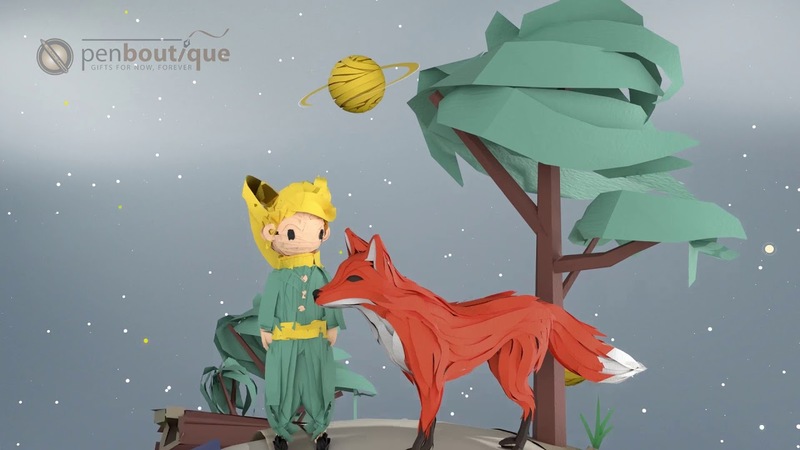 The new limited edition features the inspirational characters, Le Petit Prince and the Fox from Antoine de Saint-Exupery’s book, Le Petit Prince. He wrote this moving book during his exile in New York after he was stranded in the Sahara desert. Le Petit Prince is the most frequently translated novel in the world after the Bible, in 290 different languages. Two kind characters emphasize on the importance of bonding, deep relationships and values through the Fox that symbolizes bonding and friendship. On the other hand, Le Petit Prince transmits message of our dreams and values that makes our lives meaningful. The beautiful writing instruments are made of deep blue precious resin inspired by dark blue universe sky and the pen cap is adorned with sentence on bonding and relationship from Le Petit Prince book.The central ring of the three-platinum-coated rings features the Montblanc brand name. The pen cap is gorgeously platinum-coated with fox face pattern engraving and the clip is embellished with a yellow lacquered star symbolizing the Petit Prince’s laughter. An inspiring collection for students, writers, Montblanc followers and all pen lovers.